We at Jack’s Towing have been in business for over 15 years now and have the knowledge and experience to get you and your car back on the road as quickly as possible. We know how frustrating it can be to go to do something as simple as grocery, something that may take 30 minutes at most, and have that task turn into a 2 or even 3-hour ordeal waiting for a tow truck and mechanic to get you back on the road. We offer the quickest and safest service in the Magic Valley and we also have our own mechanic shop to ensure that you are back on the road doing what is important to you instead of waiting in for your car to be repair. Don’t take our word for it. call us today and put our service to the test! We ensure that all of our drivers are properly trained before they ever tow a single car. Serious damaged can be caused to a vehicle if not properly towed, so we put our drivers through rigorous training and many of our drivers hold the Wreck Master certification. Rest assured that the driver towing your vehicle is well trained and will treat your car with the care you would expect from a professional. You can meet our drivers and other staff on our team page. If you have a specific driver you would like to come pick you up, let us know and we’ll be sure they are the ones that help you out. We do our best to hire locally so all our staff are locals to the area. Rupert is a common stop for many semi truck drivers to get fuel and to eat. Being off of I-84 and surrounded by many other rural highways, if your fifth-wheeler ever gets into an accident or breaks down, you will want to know a towing company is near to get you to safety and the scene cleaned up. 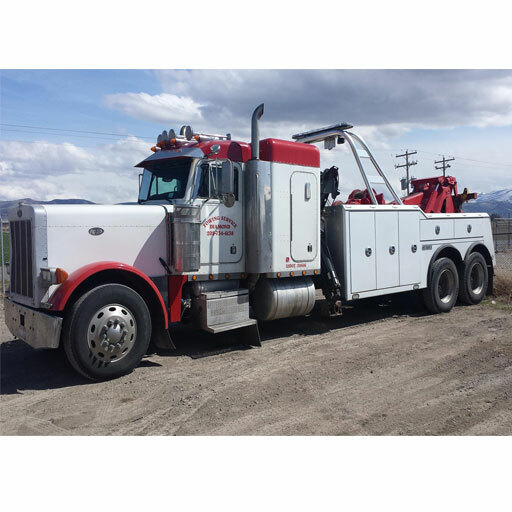 Our wrecker towing services Rupert and surrounding areas, and we will quickly respond to any call associated with a heavy duty truck accident, breakdown, or rollover. With the help of our competent drivers and staff, we will be able to quickly tow and clean up the wreckage of a semi accident as well as complete all the necessary paperwork your company and insurance may need to compensate our affordable towing statements. Don’t Wait Any Longer On the Side of the Road! So what are you waiting for?! Call us today and we will be there to pick you up in no time! Our Rupert Towing Company, Jack’s Towing is committed to offering you the best service around, and you can hold us to that. If you are even a little unsatisfied with your towing experience with us let us know and we will do what we can to make it right. We are always looking for a way to improve our service. Don’t wait. Call us today!